Mark Yates, and Kidderminster Harriers, surprised everyone today when they announced the return of the Harriers prodigal son Dean Bennett back to Aggborough for a three month long loan from Chester City. 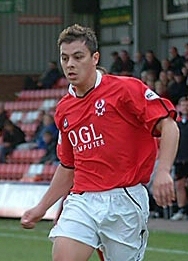 Deano joined them last season after leaving Aggborough under a cloud in 2004 to join Wrexham. When he first left the club it was under the Molby second coming era and he left just prior to a fans forum after originally agreeing verbally to stay. The better offer he received from Wrexham was enough to make him change his mind and left Molby with egg on his face. It was believed at the time that Molby and Dean didn't get on together and a certain amount of bullying took place leaving Dean in tears on occasion. It was also thought that Dean left Jan in the lurch as a means of getting his own back. During his time at Kidderminster Dean, who was signed from Bromsgrove for a fee of �30,000 by Graham Allner in 1994, made a total of 213 appearances for the club and scored thirty times in the process. He was also slightly injury prone and this carried on to his time at Wrexham where he was out for a long time with a hernia injury. He made a total of fifty four appearances for them scoring twice in his two seasons there and was never really a full time 1st team player. He then went to their great rivals Chester City in June 2006 and at first looked to be on the way to being a favourite there but with an incoming new manager he has now fallen out of favour and has yet to make an appearance this season. He'll be sure of a big, warm welcome from the home fans if he makes an appearance against Exeter City on Saturday. He'll be wearing the number nineteen shirt.